Thanks to the persistence of social innovators across the country, every day we see strategies that are working and delivering results in a rapidly changing world. This ongoing blog series will highlight the voices of our Coalition of 70+ social innovators and their innovative solutions to our country’s most pressing social problems, as well as examples of how this powerful work can be transformed into national change. Today we will hear from AnnMaura Connolly, Chief Strategy Officer and Executive Vice President at City Year, an America Forward Coalition organization, and President of Voices for National Service, an America Forward partner organization, about the strong bipartisan support for national service, and how service can be instrumental in addressing local needs in a cost-effective manner, as well as in helping young adults make the critical transition from college to career. The following post was written by AnnMaura Connolly, Chief Strategy Officer and Executive Vice President at City Year, and President of Voices for National Service, a coalition formed in 2003 in response to major cuts in federal funding that threatened hundreds of AmeriCorps programs. Despite the partisan rough and tumble of the 2016 Presidential election cycle, one idea has emerged that has significant and widespread agreement from across the political spectrum. That idea is national service. 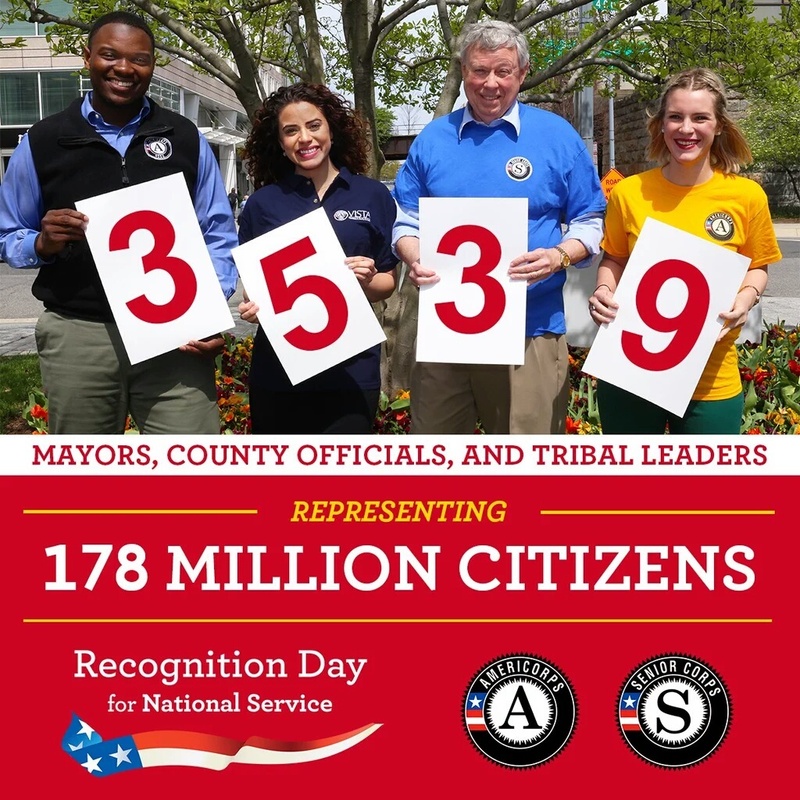 Earlier this month, a record number of mayors, county officials and tribal leaders from all 50 states and the District of Columbia, Guam, and Puerto Rico participated in the fourth annual Mayor, County, and Tribal Recognition Day for National Service. In an overwhelming display of bipartisanship, more than 3,500 officials representing over half of all Americans joined together to acknowledge the impact national service participants have in their local communities through programs like AmeriCorps and Senior Corps. This extraordinary celebration of national service was the brainchild of Wendy Spencer, CEO of the Corporation for National and Community Service (CNCS), the independent federal agency that administers AmeriCorps, Senior Corps, and the Social Innovation Fund. This massive day of recognition celebrated the 350,000+ AmeriCorps and Senior Corps members who are serving at more than 50,000 locations across the country this year. These dedicated and talented Americans tutor and mentor struggling students, assist communities as they recover from natural disasters, support military families, improve health, and build economic opportunity. Through their service, they are tackling some of the toughest challenges facing our nation, and providing essential, cost-effective support and solutions within the communities they serve. It’s not surprising that political leaders on both sides of the aisle are lining up to pledge support for national service, because national service programs are a smart investment. Last year, national service programs generated more than $1.26 billion in outside resources from businesses, foundations, and other local sources to match the federal investment. The leveraged resources actually exceeded the agency’s $1.09 billion federal appropriation. Some of the nation’s largest companies are investing in national service, including Google, Walmart, Target, Comcast NBCUniversal, Bank of America, Cisco, Microsoft, CSX, and Home Depot – along with thousands of small businesses, community foundations, and local agencies. They are lining up to invest because they recognize that national service programs deliver a great bang for the buck. And that’s been confirmed by a cost benefit study conducted by an economist at Columbia University which found that for every federal dollar invested in CNCS, struggling communities receive up to $4.00 in benefits. That’s a pretty unique value proposition for a federal program. And the payoff is huge. Through national service, young Americans learn valuable workplace, communication, and leadership skills. This on-the-job training and skill building helps AmeriCorps alumni transition from school to the workplace and accelerates their career growth. Many find an aptitude and passion for work in the nonprofit sector or related careers such as teaching or disaster preparedness and response. CNCS recently released a report documenting the long-term outcomes of AmeriCorps alumni – the first nationally representative study of alumni across programs since 2008. The alumni reported that there were substantial benefits to participating in AmeriCorps programs, including helping them figure out the next steps of their career and increasing their ability to work with others and to respond to unexpected challenges. In fact, an overwhelming 90 percent of AmeriCorps alumni agreed or strongly agreed that they could solve difficult problems, accomplish goals, handle unexpected events and unforeseen situations, remain calm, and identify multiple solutions. AmeriCorps alumni also reported having high levels of cultural competency and the ability to work with diverse groups of people – extremely important skills in an increasingly diverse country and world. Strong support for national service goes beyond local elected officials, the private sector, and AmeriCorps alums—these programs are also embraced by the general public. A recent poll conducted by TargetPoint Consulting found that 83 percent of voters across nine presidential battleground states want Congress to maintain or increase federal spending on national service programs. This overwhelming support defies party lines, including 78 percent of Republicans, 84 percent of Independents, and 90 percent of Democrats surveyed. Perhaps even more telling, the poll also found that almost 30 percent of self-identified “Tea Party” supporters want to see an increase in funding for national service, despite a strong belief in the need to scale back federal spending dramatically. Americans have seen the power of national service in their communities, and know it’s worth the modest federal investment. Remarkably, even with this overwhelming bipartisan support from many corners of the country, just last month the House of Representatives Budget Committee once again recommended zeroing-out federal funding for CNCS altogether. Members of Congress should listen to their constituents – including their local mayors, county officials and tribal leaders – and expand national service, not cut it back. At Voices for National Service, we are deeply grateful to the coalition of national and local service programs, state service commissions, and individual champions of service we engage to educate the nation’s leaders on the impact of national service programs. Together, we work to strengthen support for the federal investment in national service initiatives. As a member of the Voices Steering Committee, America Forward is our partner in that effort, helping to make service a priority for this Congress, future Congresses, and the next Administration. We are also glad that America Forward has identified service as a viable strategy to meet many of its Coalition’s policy objectives and goals. By highlighting national service in their presidential briefing book, Moving America Forward: Innovators Lead the Way to Unlocking America’s Potential, America Forward recognizes that national service is a common engine many social innovators can utilize to achieve significant and lasting change. Collectively, we must challenge our nation’s leaders at every level of government—as well as those running for President—to commit to expanding national service. It makes good economic sense, good political sense, and good practical sense. Join the conversation! Follow @voices4service, @annmaura, and @America_Forward, and tell us how service has impacted your life and your community using #NationalService and #AFPresidential16. For more information about Voices for National Service, visit www.voicesforservice.org.